By 1916 it was clear that there were not enough volunteers, and conscription was introduced. Some professions were exempt, but the rules kept changing during the war, The newspapers have accounts of tribunals where men appealed their call-up. At least three Avoch fishermen did so as conscientious objectors. Almost a hundred men from our area were killed and commemorated on local war memorials. Countless others were wounded and returned home to try and rebuild their lives. 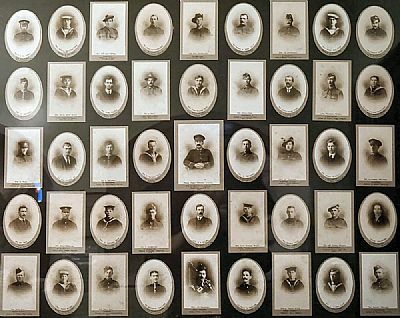 The exhibition also features a few stories about some of these men. Binders at Groam House Museum and at Fortrose Library provide information gathered so far on those who served. As much as possible of that informaton is also presented on this website. We hope people will help to update this information. Left - War Memorial in Avoch Parish Church with pictures of men from the parish who were killed in the war.